Congressional Budget Office data show where increases in the national debt came from over the past decade. The graphic below presents a lot of information and Panderbear is still puzzling over some arcane details, but a few broad themes are apparent. Of the $12.7 trillion added to the debt, $3.6 trillion is lost tax revenue due to the Great Recession, $1.4 trillion is attributable to President Obama's policies, and $7 trillion to President Bush's. The other $700 billion are loans that hopefully will be paid back. The bulk of Obama's tab consists of the Recovery Act and the middle class tax cut. Ignoring anything less than a $1 trillion, half of Bush's bill is the cost of two wars and increased defense spending and the other half is tax cuts. The majority of debt added by Obama consisted of standard Economics 101 inspired deficit spending to jump-start the economy. Contrary declarations of pandering politicians notwithstanding, a consensus of economists agree that the current situation would be much worse without that spending. If anything the stimulus was too small. 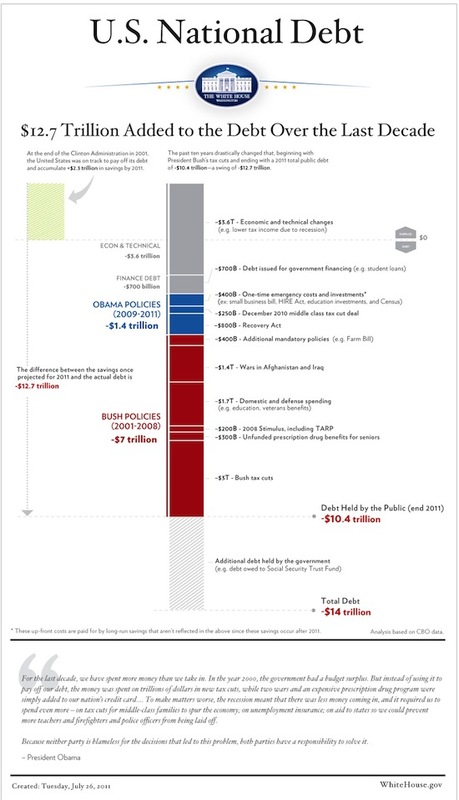 Bush's additions to the debt went for war, defense build up, and tax cuts. Almost all of the $7 trillion Bush added to the national debt were self-inflicted wounds, monies that need not have been spent or were lost to tax cuts mostly benefiting the wealthy. The Bush tab is five times Obama's and the ratio would be higher still if costs of the recession were added to Bush's total. It's clear that anyone attempting to pin the exploding debt on President Obama is either ill-informed or pandering.